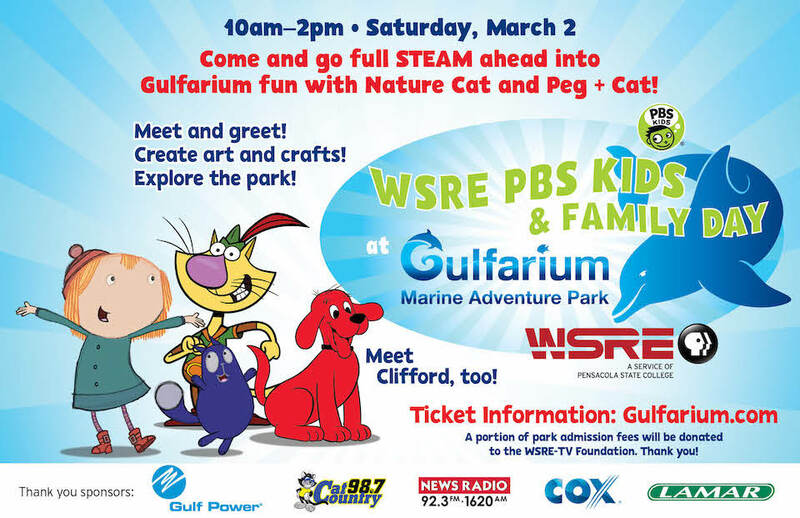 Come and go full STEAM ahead into marine park fun during the fifth annual WSRE PBS KIDS & Family Day at Gulfarium Marine Adventure Park! Nature Cat, Peg + Cat, and Clifford the Big Red Dog will be at the park from 10am to 2pm, while their young fans engage in hands-on activities including arts and crafts, a bounce house and scavenger hunt. Gulfarium Marine Adventure Park will operate under regular park hours with their dolphin and sea lion shows, animal exhibits and aquariums. A portion of the proceeds from the day’s admission fees will be donated to the WSRE-TV Foundation. Please join us in thanking Gulfarium Marine Adventure Park and our media sponsors: Cox Communications, Lamar Advertising, Cat Country 98.7 and NewsRadio 92.3 FM & 1620 AM.